It was early 1999 when I received my first copy of The Artist Way, A Spiritual Path to Higher Creativity. The book by Julia Cameron was touted as a breakthrough for blocked artists to renew their work and their creativity. Little did I know that it would change my life. The last few years of my morning pages journals. It was a late Christmas present from my best friend Pat. She had already had the book and worked through the 12 week process within it and felt that I would really benefit from it as well. The exercises within the book help the reader to explore their motivations and history while delving into new ideas and ways to be more creative in one’s life. Each chapter explores a different area of our lives, but the biggest tools to come out of The Artist Way for most people are the artist date and the morning pages. The weekly artist date is a way for the artist to fill their buckets for ideas, nurture the child within who needs play and exploration to bring forth new ideas. Breaking out of a routine of work is important for an artist to not only acknowledge that creative work is important, but to reward oneself in validating our identity as creative beings. I must admit that I am not very regular in taking a weekly artist date, in fact I’m doing well if I make it once a month. After an artist date, I feel recharged. Sometimes that means new ideas, sometimes it is renewed energy to continue ongoing projects, sometimes it is just relief at a break in my routine, but it always feels beneficial to my creative self. The morning pages are, to me anyway, little less straight forward. Each morning, I write three pages in a journal. Handwritten with no particular subject, the point is to fill three pages with whatever comes to mind. A brain dump or pressure release is how I often see it. The morning pages are three pages written by hand. 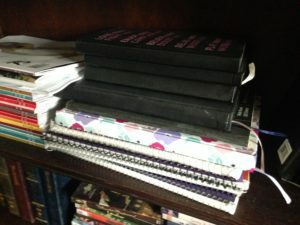 I’ve used marble notebooks, graph paper sketchbooks, leather bound journals and spiral college ruled copy books. I’ve written with markers, drawing pencils, dip pens, fountain pens and colored gel pens. I see the morning pages as kind of a self therapy. No judgement, no filters and no audience but yourself. They are not meant for anyone else to read. The purpose is the process of communication with yourself. What’s bothering you that you don’t allow to come to the surface in the course of your day? What project are you putting off and why? Being stuck in jobs, relationships and spaces where we need to break free, but can barely contemplate what it take to make that happen, we can use the morning pages to slowly think about possibility of change. What is it about a comment from a friend that triggered an idea that maybe you didn’t have the time to consider? Our morning pages give us the space to consider these things and much more. I’ve been a advocate for The Artist Way for about ten years now by facilitating the process of going through the books for individuals and groups. I don’t see myself as a teacher, only a fellow artist. Each time I go through the book I gain new insights about myself and my life as an artist. Of course I go through periods of time when I don’t do them, rarely more than a week, but then I usually realize that something is bothering me that I’m resisting. At that point, I make a commitment to myself to face whatever difficulty it is and explore it in my pages. Ideas and solutions then present themselves. I recommend the tools within The Artist Way as not only for creatives and artists, but for anyone. I feel we are all creative beings and by acknowledging that in ourselves, we can embrace these strengths to build a better life.